This post is Part III of the larger mini-series titled “A California Christmas.” The posts in this series include: Part I: Ten Ren Tea Station, Part II: Din Tai Fung, Part III: Sushi Gen, Part IV: Mrs. Knott’s Chicken Restaurant, and Part V: Melisse. If you haven’t figured out by now, I’m a huge fan of sushi, and I try to seek out the best sushi in every city that I visit. Top picks include Kyubei in Tokyo and Sushi Yasuda in New York City. One particular night, when Bryan went to a Laker’s basketball game with one of his other friends, his parents decided to entertain me for the night by taking me to Little Tokyo. Of course, the moment I heard “Little Tokyo,” I jumped onto the iphone and started to do some research. Over and over I kept seeing Sushi Gen show up on various sites as a excellent place to try. 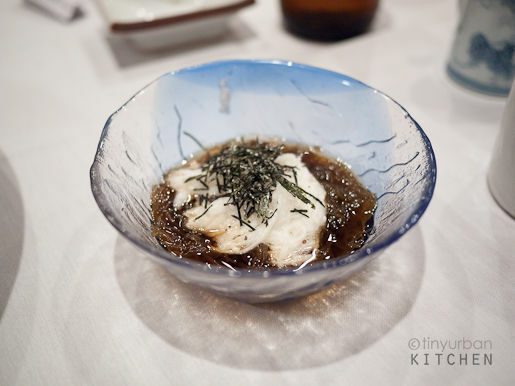 It was not until after the fact that I realized I had already blogged about Sushi Gen! My mom had told me that all the Taiwanese people know about this place and rave about it. So funny that I forgot. So, of course I had to go try it. I had heard that the lines there are super long but it’s worth the wait. Luckily, they actually take reservations, and I was able to reserve a coveted 7pm reservation without any problem, calling earlier the same day. Between the three of us, we ordered a Sashimi Deluxe Combination ($35), a Sushi Deluxe Combination ($26), Steamed Clams ($8), and a few nigiri a la carte. The deluxe combinations come with a bunch of stuff, such as this deliciously simple salad with greens, bonito flakes, and a simple dressing. It was light, well-flavored, and a great way to whet the appetite! We also got an interesting side of mountain yam and seaweed. If you have never had mountain yam before, you might be a bit weirded out by it. The texture is sort of slimy. I thought the dish was good, but if you’ve never had anything like it before, you just might think it’s a bit weird. Of course, there was also miso soup. I did not drink the miso soup, so I actually can’t comment on it. The clams were delicious, and I think they were Bryan’s dad’s favorite dish. The soup had a beautiful clam flavor, and the clams themselves were fresh, juicy, and delicious. For $8, this was a great value. And then the most amazing dish of them all – the Sashimi Deluxe Platter. Wow! I was really amazed. This entire platter (including those yummy starters) was only $35! You can look at the picture to see what it includes, but it had at least 5 slices of toro (fatty tuna – yum, my favorite! ), salmon, maguro (tuna), mackeral, octopus, squid, and much much more. Everything was really fresh and delicious. I still couldn’t believe this was only $35. I kept thinking about Sushi Yasuda, where each piece was about $5 . . . The Sushi Deluxe, though not as awe-inspiring, was still a good deal for $25. It included a nice array of various nigiri and also some simple rolls. I also got some of my favorite nigiri a la carte, such as salmon, toro, and hamachi belly. Everything was deliciously fresh and the service was good. I actually really appreciated our server. She suggested that we share a few deluxe orders (definitely the most cost effective option!) and actually dissuaded me from getting an a la carte order of toro sashimi because she knew our sashimi deluxe combo would already have it. She also piped in “I just saved you $35!” I was sooo appreciative. We were stuffed after our meal, and the extra toro order would have been too much! Is it the Best Sushi In LA? I really can’t comment on that, since I have only been to a few sushi places in Southern California. I would say it is definitely worth the visit mostly because it’s such a good deal. The fish is very fresh, the food is delicious, and those deluxe specials are awesome. In terms of over all excellence, it’s not quite in the same league as restaurants such as Kyubei and Sushi Yasuda, mostly because their fish options are more ordinary run-of-the-mill fish and not the more interesting and exotic ones you would see at both Kyubei and Sushi Yasuda. Neverthless, if you are looking for expertly prepared fresh and delicious sushi for a great price, Sushi Gen is definitely a great place to go. Note: I heard lunch is even a better deal because you get the same fish for cheaper prices. I can’t verify that the fish is the same, but according to the lunch menu, the Sushi Deluxe is only $12.50 and the Sashimi Deluxe is only $25. Next time I go, I’m definitely going to try the lunch! This place look amazing! I love the photo of the clams, they probably would have been my favorite too! Looks awesome, especially that sashimi deluxe plate. I love sushi too…I could eat it every day (if I could afford it!) Great photos. My husband and I eat there whenever we’re in Los Angeles. It has this amazing sashimi lunch special on weekdays. It’s a huge amount for this very unbelievable price. People line up even before the restaurant opens. It’s so worth it. I’ve always been a fan of Southern California sushi. Looks like a great meal and how nice of Bryan’s parents to spend the evening with you! Sashimi lunch is indeed incredible, with an incredible price as well! The platter comes with a large variety of sashimi, cooked fish, spicy tuna, fish flakes, maybe even miso soup if I remember correctly… Anyway, when I’m back in town, I always make sure to take a visit. Get there early though! Arrive there around eleven or so.. people will be lined up! To escape cold and snowy Toronto during March Break we decided to do a “Culinary Tour” of SoCal. My wife read your review of Sushi Gen and suggested that we dine there since we’re sushi fanatics also. Basically, we think your review was bang on. Great sushi and excellent service. We were seated at the sushi bar and the very charming sushi chef Hasato San took very good care of us and created very interesting delicacies such as Needle Fish, Kampachi and Toro sushi for us. Thanks so much! I love comments like these where people tell me how they were able to use the information on my blog to have a fantastic time! I’m so glad you enjoyed your meal there! I personally can’t wait to go back again. I have been a going to Sushi-Gen since the early 90’s back when the owner would greet customers, now his wife. My co-worker and I use to sneak out for lunch at around 11am to beat the crowd and would get seated right away. That no longer applies however, I would NOT trade this place for any other Japanese restaurant! The wait is worth it. The food AND service are Excellet! Prices have changed (as expected) but still affordable. I craved this place when I was expecting my 2nd child (now 19) whom the owner and everyone else, has seen him grow up along with the 1st. Our favorite, the Sashimi Deluxe Plate w/extra rice, misso soup and wasabi & green tea. We always come out w/great big smiles, our favorite spot!